Artichoke season is here, and as I’m a big fan of this unique vegetable (actually, an edible flower bud from the thistle family), I always try to find new ways to serve it. 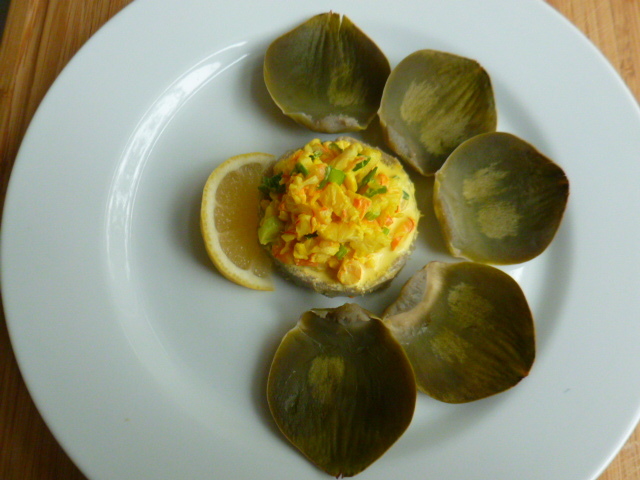 This time I’ve decided to use the artichoke hearts as a bed for serving a tasty shrimps salad. The salad was flavored with saffron and lemon mayonnaise, as both compliment the mildly sweetish artichoke flavor, as well as the shrimps’. Combining these two elements was wonderful, both in flavor and color, and made for a great first course dish. Unlike in THIS recipe, here I’ve cooked the whole artichoke, as I wanted to enjoy the tasty tip part of the leaves as well, to double the fun. 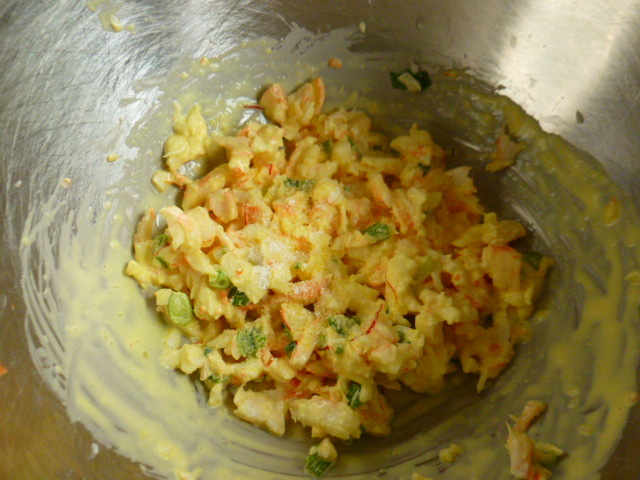 The leaves were dipped in the remaining saffron mayonnaise that I’ve used to flavor the shrimps salad, and made for a tasty snack. Try both and enjoy. * Fresh artichokes are obviously the best choice here, but if you can’t get them, frozen artichoke hearts can be used instead. 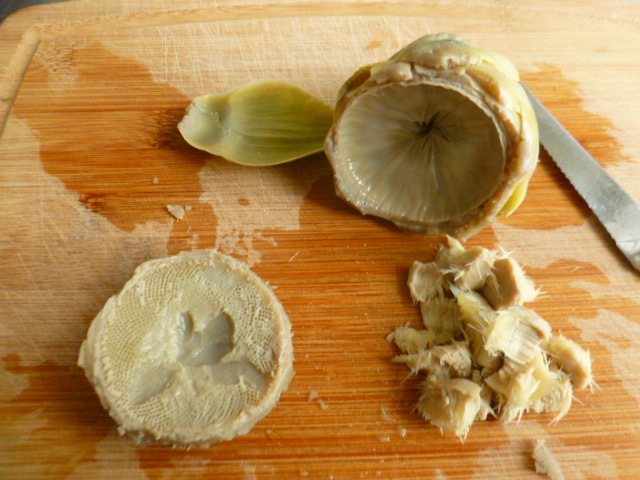 Prepared marinated artichoke are not suitable for this dish. * If you’re not up to preparing the saffron mayonnaise yourself, simply mix ½ cup good quality mayonnaise with 5-6 saffron threads that were soaked in 1 Tbs warm water for 5 minutes, 2 tsp lemon juice, ½ tsp mustard, 1-2 drops hot sauce and salt to taste. * The shrimp salad is also great in shrimp rolls. 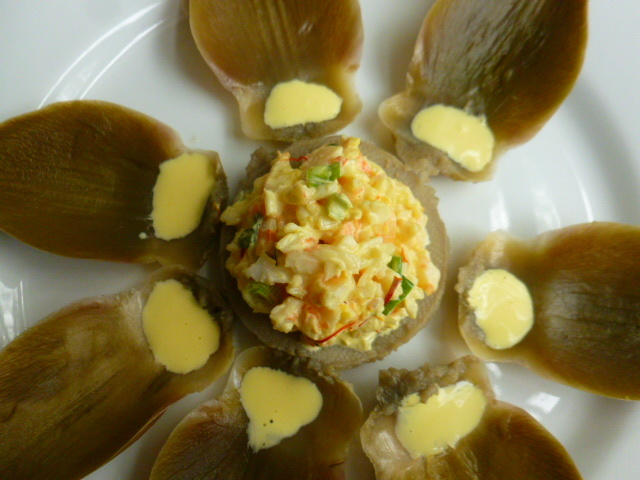 * Cooked lobster tail, crab meat, or poached white fish, can be used instead of the shrimps. 1. 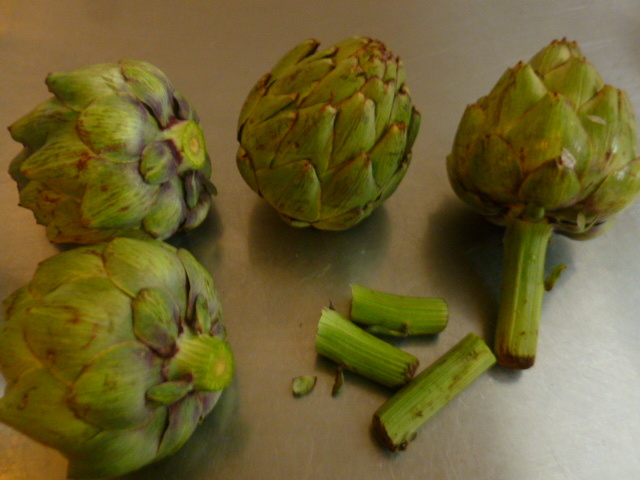 The artichokes: cut off the stem of the artichokes close to the base. Place them in a deep pot and cover with water. Add the lemon and salt and bring to a boil over high heat. 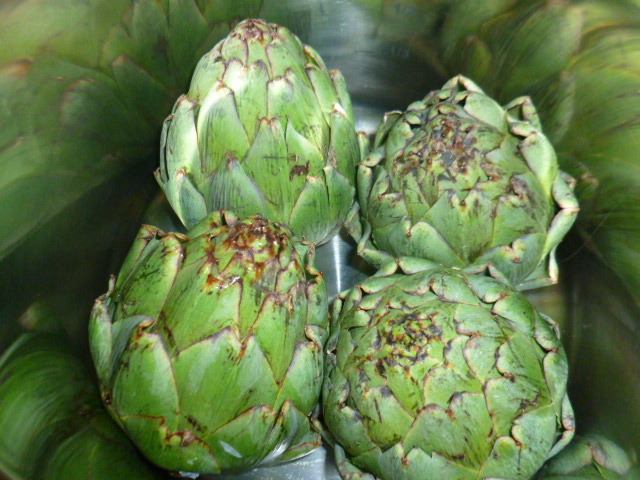 Lower the heat to medium, and cook, covered, for about 20-25 minutes, or until the artichokes change color and you can easily pull out a leaf from the center of the artichoke. Drain and let cool to room temperature. 2. Remove the outer leaves, keeping them aside for dipping. 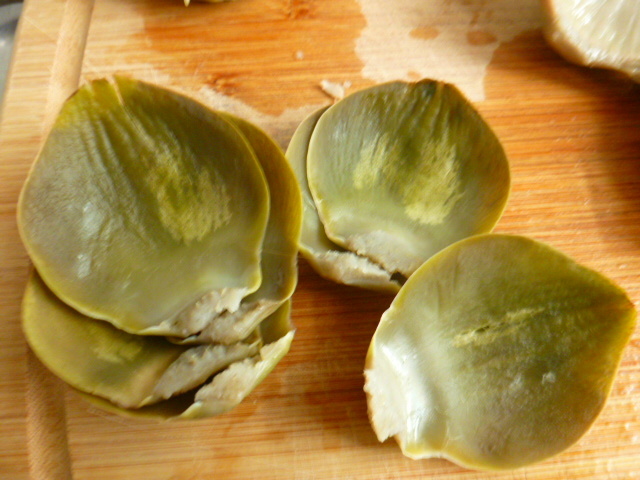 Discard the inner leaves and remove the fuzzy part. Cover and keep at room temperature until serving. 3. The salad: place the shrimps in a pan, cover with water and add the lemon and salt. Bring to a boil and cook for 5 minutes, until they change color. Cool to room temperature. Peel and chop roughly. 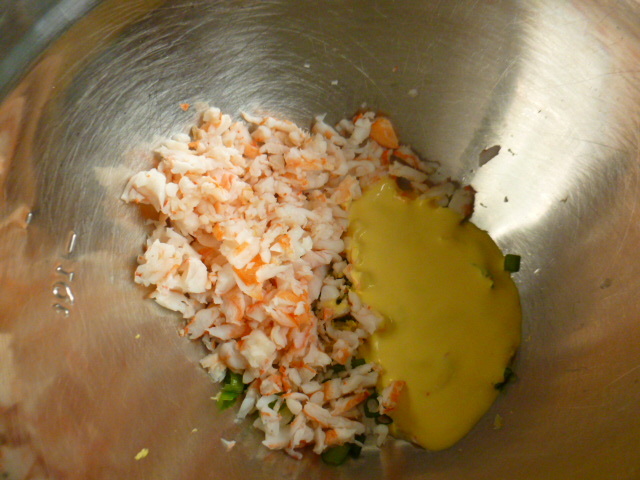 In a small bowl, mix with the scallions and ¼ cup of the saffron mayonnaise. Adjust seasoning if needed. 4. 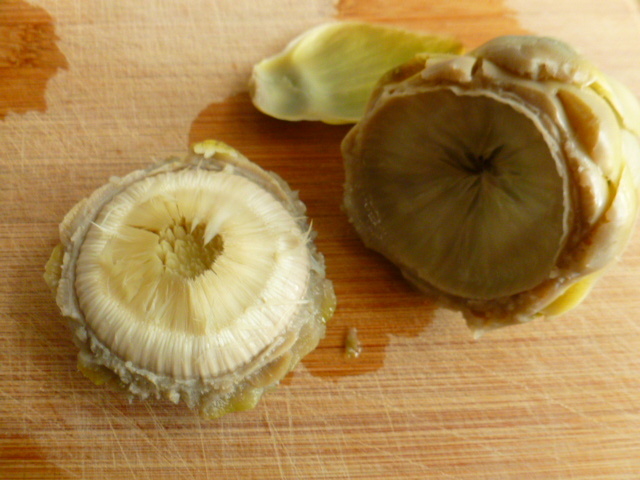 Place the cooked and cleaned artichokes hearts on a serving plate, and add the shrimp salad on top. Garnish with some outer leaves, or a slice of lemon, and serve immediately. Thank you Judi, I’m glad to hear. This is a WOW dish, Ronit, and the saffron mayo recipe is a keeper! Looks wonderful. I love shrimp and saffron. What a great idea! 👍🏻 it looks really fancy too. This is a keeper recipe. Well presented and designed. The saffron mayo looks deee-vine! Haven’t had an artichoke in ages. Time to correct that! The presentation is beautiful! 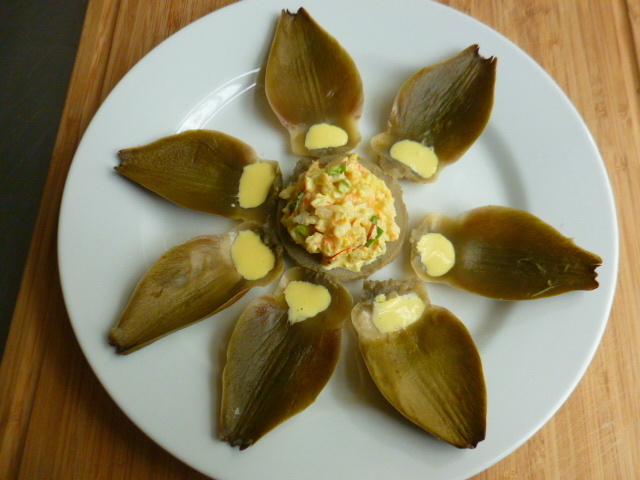 I’ve never tried making any artichoke dishes that went beyond the basic boiled artichoke. The combination of artichoke and shrimp salad sounds wonderful. I grew up on artichokes, living in California. It’s funny to me that I still encounter people who have never tried one. But they are a bit odd, and do take a bit of work! I absolutely love what you’ve done here. What an elegant first course you have created…I like everything about it. I think it is really special. Oh my gosh what a treat this is! 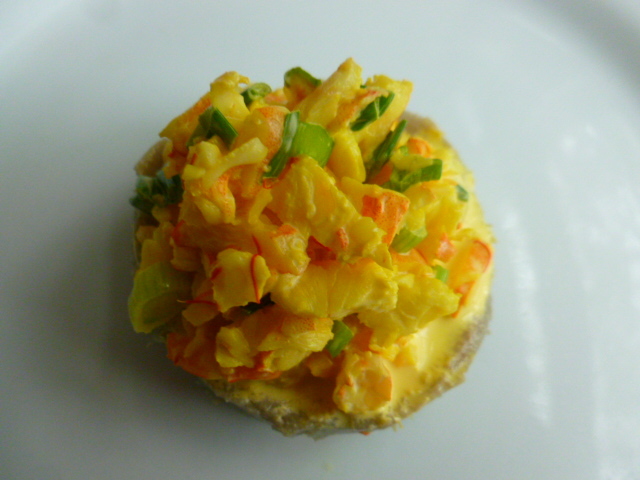 Saffron mayo – it’s just incomprehensible to me that there is such a thing! Wow! You’ve kind of blown my mind, Ronit!! 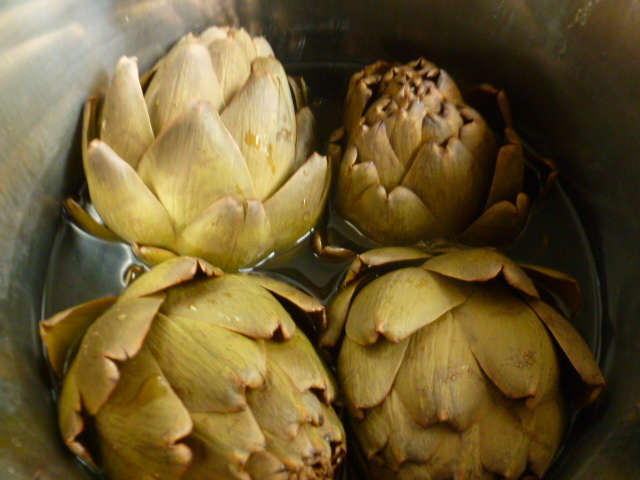 I too love artichokes Ronit – fantastic and inventive way to serve them, inspires me to venture beyond simply preserving them in vinegar! Looks wonderful, lovely presentation too Ronit!